Tough water proof barrier coating. Improves flexural and tensile strength. Underground and water retaining structures. Hairline crack repairs. Porous surface sealing. KEM DAMPSEAL is specialty treatment coat for internal damp wall and ceiling which can be applied both in brushable and paste consistency. This product is antifungal, non-toxic, non-hazardous, and resistance to mild acids and alkalis. 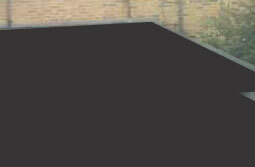 Waterproofing RCC water tanks. Specialty treatment coat for internal damp walls and ceiling. Primer for painting on internal and external walls. 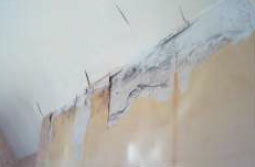 Damp wall coating for toilets, kitchen walls and lift pits. Applied in sterile areas of food and pharma industries. Mixing ratio as coating = 1:1:1 (Base: Hardener: Water) by weight. Mixing ratio for Putty = 1: 1: 2 by weight (Base: Hardener: White cement) Coverage as finish coat: 35 - 40 sq. ft / Kg 2 coats Coverage as putty: 6 - 8 sq. ft / kg / coat (Coverage varies with the actual site condition). KEM PROOF EWC - BLACK is heavy duty bituminous elastomeric waterproof coating for asbestos sheets,sunken portion of toilets and underground structures. Asbestos cement roofs and around J hooks. Sunken portion of toilets. Sewage pipes. Plinth foundation. Basement and other underground structures. 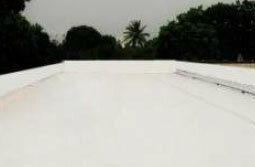 KEM Proof EWC - White is heavy duty aliphatic acrylic elastomeric waterproofing for external surfaces. It is water based, can be tinted to any shades, resistance to dirt picks, anti-fungal and anti - algae and can be applied both by brush and roller. External walls. Roofs and parapet walls. Designed for exterior RCC, cement sand plastered surfaces. KEM PROOF PUWC is an elastomeric liquid applied tar extended membrane based on polyurethane prepolymers. Cures by reaction with atmospheric moisture to give a continuous film that is rubber-like and elastic. Since it is elastomeric it is not adversely affected by extremes of temperature. It is resistant to cracking at low temperatures and does not suffer thermal flow at elevated temperatures. It can be applied by brush, airless spray or roller without the need to mix, stir or heat before application. It is designed to bond to many types of substrate particularly those commonly requiring a waterproof membrane in ‘tanking’, above and below ground, and internal wet area sections of buildings. It is essential that the substrate and structures are properly prepared and stable. 1 litre / m² on a smooth flat surface will provide an adequate film thickness of approx. 1mm. Any surface texture will increase the surface area which must be allowed for when calculating usage e.g. on a chipping embedded surface the actual area will be approximately doubled. KEM HYDROSHIELD AE 500 is a high build, polymer rich elastomeric coating. 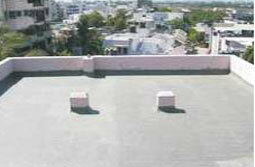 Terrace, Roof slabs, Cement based roofs, External walls. KEM BRUSH COAT is a high performance two component elastomeric cementitious waterproof coating for concrete, slabs, masonry and as surface protection for reinforced concrete. 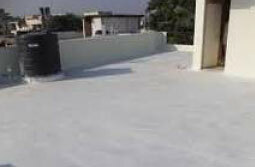 Specialty treatment coat for internal and external waterproofing. Bathrooms, basements, toilet and wet areas. Dam Walls, swiming pools, basins, water storage tanks, balconies, terraces. Application in marine areas. Protective coat against carbonation and chloride attack. 6 sq.ft. 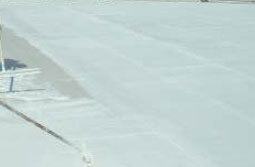 / Kg for 2 coats for total minimum thickness of 1 mm (DFT) For protection against physical damage use 15 - 25 mm thick cementitious screed. KEM PROCRETE is an acrylic emulsion based admixture for waterproof coating, bonding agent for repair, mass-in-fill and non-shrink polymer modifier cement grout system. KEM PROCRETE enhances the properties of cement slurry mortar and concrete such as flexural strength water penetration resistance etc. 1.5 to 2 m at 1 mm DFT, when applied in above ratio. Coverage will depend on surface profile. KEM PROOF ULTIMATE is a high quality acrylic emulsion based coating. It is elastomeric in nature and has good resistance to weather and sunlight. It is single component system containing inert pigments and fillers suitable for application by brush, roller or spray. It prevents chloride ion ingress and exceeds all the requirements of a coating that resists carbonation and provides a smooth, durable and water repellent coating for concrete and masonry surfaces. KEM PROOF ULTIMATE is designed to bound and to protect concrete structures against carbon dioxide, air/water born chlorides. 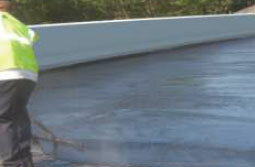 It is also used as elastomeric water repellent coating for asphalt, timber, fiber cements and zinc sheets. It may be applied to many types of substrates particularly those commonly requiring elastomeric anti carbonation and water repellent coating like concrete bridges, highways, structures in marine environments, car parking structures, commercial and industrial buildings, flat and slopping roofs. KEM Prime 89: 10 - 12 m²/ltr. Note: Coverage may vary depending upon the texture, porosity and condition of the surface. KEM Proof CWC 2 K is a two component system consisting of a powder component and a latex component. The powder component is a blend of cementitious material and chloride free minerals. The liquid component is a dispersion based on styrene butadiene. KEM Proof CWC 2 K is a solvent free penetrative sealing system and once applied forms a barrier for water ingress. The ability of the system to penetrate in to the substrate makes the surface highly impermeable to water pressure and also acts as vapor barrier . Coverage for Toilets and Sunken 2 portions is 1.4 to 1.6 kg/m . Coverage for Multi Level 2 basements is 2 to 2.5 kg/m . Note: Coverage may vary depending upon texture, porosity and condition of the surface. Precautions: In higher temperatures, KEM proof CWC 2 K dries fast, so small quantities should be mixed for application. KEM PROOF 86 is a high quality, acrylic emulsion based coating. It is elastomeric in nature and has good resistance to weather and sunlight. 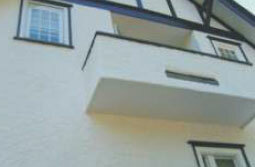 As waterproofing and protective coating for exterior walls of buildings. Typical substrate includes masonry, concrete, cement and waste plaster as well as cement boards. 3-4.5 m /litre for 2 coats Note: Coveragemayvary depending upon the texture, porosity and condition of the surface. KEM PROOF 87 is an elastomeric coating based on selected acrylic co-polymers. 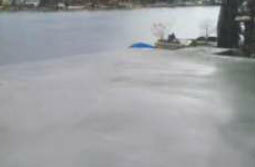 When applied, it cures to form a durable, protective, waterproof membrane. It is applied by brush or roller. It can be applied on concrete, cement board, wood, brick, stone and tiles. It is a single-component emulsion containing inert pigments and has a brushable consistency. 2 - 2.5 m /litre Note: Coveragemayvary depending upon the texture, porosity and condition of the surface. KEM BRUSH 88 is a high performance, two-component elastomeric cementitious waterproof coating for concrete, slabs and masonry. 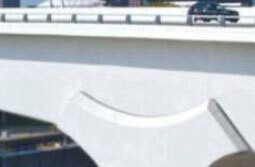 It also acts as surface protection for reinforced concrete. 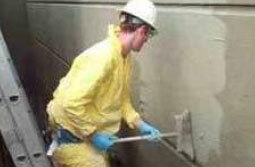 Designed for waterproofing hydraulic projects, it is a specialty treatment coat for internal and external waterproofing. 45 - 50 sq.ft / 2.5 kg / Coat Coverage depends on roughness and porosity of the surface. KEM Prime 89 is water based primer composed of acrylic emulsion polymer, properly selected fine fillers, white pigments and additives in water as a medium. 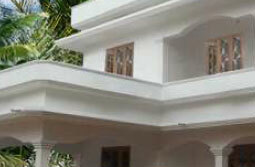 It is used as primer over exterior and interior building walls before application of water based paints. 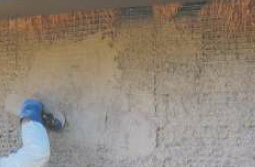 Priming of plastered walls, asbestos, brick, false ceiling, concrete surface etc. 10 – 12 m / ltr / coat Coverage may vary depending upon the nature and texture of the substrate . KEM PROOF 90 is special blend of polymers, surface active agents and reactive chemicals. KEM PROOF 90 is used as an admixture for cement concrete, mortar and plasters. It has plasticizing and water reducing action along with crystal formation to block the pores in cement based products. 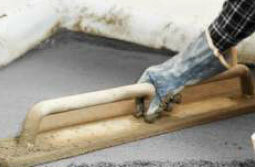 Due to this it acts as in integral waterproofing agent, making the cement concrete and plasters water tight.